Don't miss the chance to visit the San Diego Botanical Garden, 35 acres of beautiful botanical gardens in San Diego North County. It's official name is San Diego Botanic Garden, and until 2009 was called Quail Botanical Gardens. I love this garden. It offers a variety of specialized and unique gardens to explore. For small children, there is a special children's garden which is sure to delight. The San Diego Botanic Garden offers a variety of microclimates, ranging from a desert environment to a tropical rain forest, all within beautiful 35 acres. The gardens include restful vistas, flowering trees, majestic palms, and the nation’s largest bamboo collection. 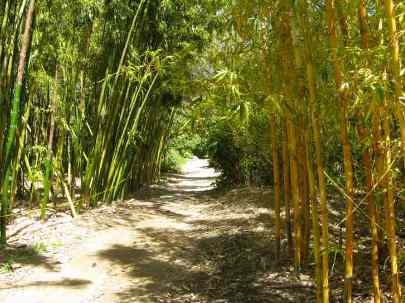 Rare Bamboo Groves - The bamboo garden is the largest bamboo collection in the United States, featuring both clumping and spreading bamboos. This is the first area we visit when we go see Quail Botanical Garden, since the bamboos are such fascinating plants. Hamilton Children's Garden -in summer 2009 they opened the new Hamilton Children's Garden, the largest interactive children's garden on the West Coast. Many events for children are held here. There are many fun kids things to do and explore, including the tree house, sun dial, A-Z garden, quails, and edible plants. 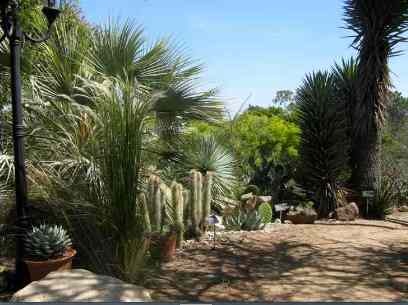 Desert Gardens - Enjoy the plants that survive in the desert region near San Diego. Botanic garden ideas here. Mediterranean Climate Landscapes - Since San Diego Calif. is one of the few places in the world with a Mediterranean climate, we can enjoy plants from different places in the world. Tropical Rainforest - The rainforest is awesome. 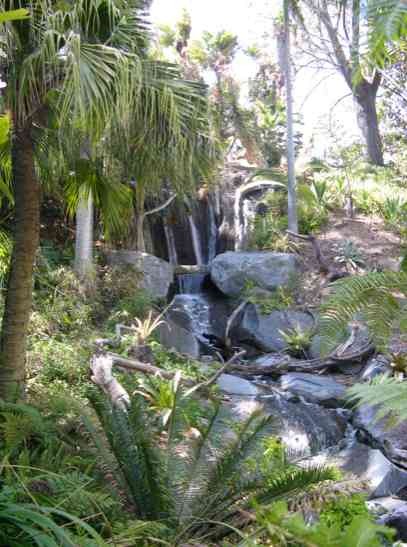 Where else can you see a rain forest and waterfalls in San Diego? Botanical garden is the perfect place to visit on a hot day. California Native Plants - Locals can get ideas for planting California native plants for your garden, then visit the gift shop to purchase some species. Herb Garden - Enjoy the lovely smell of the herbs as you stroll through the herb garden at Quail Botanical Gardens. Firesafe Landscaping - Anyone who is interested in keeping their home safe from fires should check out the tips and examples for how to minimize your fire hazard with fire safe landscaping. 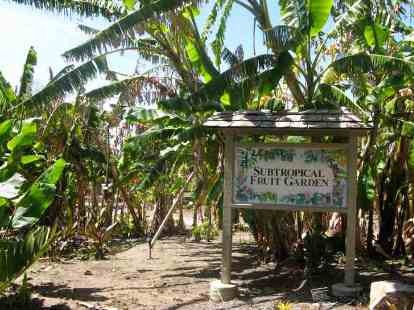 Subtropical Fruit Garden - My kids didn’t know bananas grew on trees until they saw the sub tropical fruit garden at Quail Botanical Garden. Native Coastal Sage Natural Areas - There are many coastal sage bushes that populate these natural areas. Numerous Exhibits and Events - Many special exhibits and events are held at the San Diego Botanical Garden. San Diego Botanic Garden in a premier botanical gardens in Encinitas, California, just 30 minutes north of San Diego. The botanic garden have over 35 acres of varied micro climates, from desert to rain forest. Operating Hours: Daily from 9 - 5. Closed Christmas day. Open late on summer Thursday evenings until 8:00 PM from June - August. Ticket Prices: $14 for adults; Seniors, students, active military $10; Children ages 3-12 $8; Members; children ages 2 & under free. Free admission on the first Tuesday of every month! You may find discount coupons in some of the local free papers. Food: Head to downtown old Encinitas afterwards and enjoy lunch or dinner one of the many restaurants, just a mile away (head west on Encinitas Blvd then left on highway 101) near Moonlight Beach. Special Events: They offer a number of special events each year including annual Chocolate Festival on Mother's Day weekend, Fairy Festival in June, Orchid Festival in September, and Garden of Lights in December. Directions to San Diego Botanic Garden from San Diego CA - Go north on Interstate 5, exit Encinitas Boulevard (about 30 minutes north of San Diego), turn right (east) about 0.5 miles, then left on Quail Gardens Drive (0.3 miles). The entrance to the San Diego Botanic Garden will be on your left. Directions to Quail Botanical Gardens from Orange County, Carlsbad and Ocenside - Go south on Interstate 5, exit Leucadia Boulevard in Encinitas, turn left (east) about 0.5 miles, then right on Quail Gardens Drive (about 1 mile). The entrance to the San Diego Botanic Garden will be on your right. Public Transportation to San Diego Botanic Garden - From the Encinitas train Station take the NCTD Breeze (bus) route 309 Towne Center. Get off at the Encinitas Blvd stop at Westlake St./Quail Gardens Drive. Walk north on Westlake St to the San Diego Botanic Garden Entrance, approximately 0.3 miles.